« Was June Your Lucky Month? We were at the allotment at the weekend and Jemima, being a lover of all fruits, was going round asking which berries she was allowed to pick. She set about the redcurrant bush and before I knew it she’d filled a tub full of red currants…and along with the red ones there were green ones and all shades in between. On the whole they were not quite ripe enough to pick but Jemima’s enthusiasm was hard to contain. We also don’t net our fruit for fear of trapping birds and if we had left them on the bushes for longer a lot would probably have been eaten. So I took my large tub of under ripe redcurrants home and put them on a window sill, with the lid loosely fitted and left them for a couple of days. Hey presto! They all ripened beautifully and so I will probably pick them early again next year. 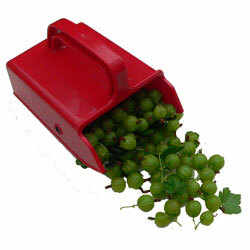 For super speedy berry picking why not try the handy Berry Picker. Available in two sizes it allows you to harvest the fruit up to ten times faster than usual. I decided to make some redcurrant jam with my bumper harvest. It was so easy to make and extremely delicious. Poor into clean glass jam jars, seal with a lid and store ready for use.